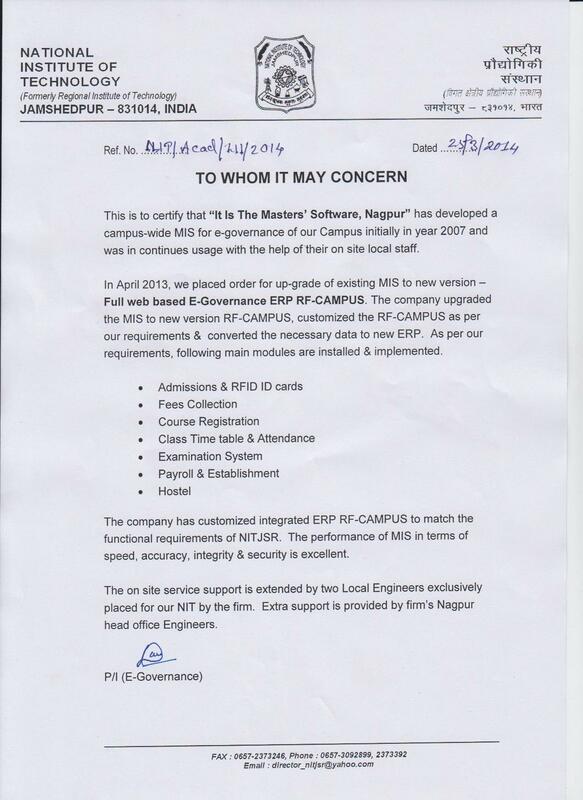 MasterSoft developed and implemented Cloud-based ERP - CCMS - Centralized Campus Management System. The performance of the ERP in terms of speed, accuracy, integrity, and security is excellent. The ERP has streamlined the processes, reduced the workload and the generated reports helped us in decision making. The e-Governance ERP has been customized with functional requirements of GCEK & system is fully functional. The performance of RF-CAMPUS modules in terms of speed, accuracy, integrity & security is excellent. The ERP is under warranty & is maintained by the developer & their services are excellent. 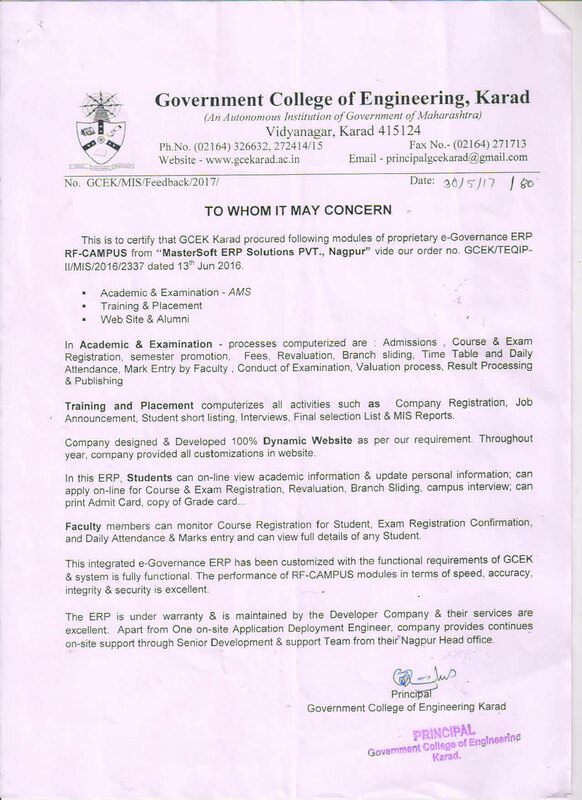 The e-Governance ERP RF-CAMPUS is customized & commissioned by company and all major important modules are in active usages. Old records of Academic & Examination, Establishment & Payroll, Library, and Web are in process of conversion by the company into new ERP. 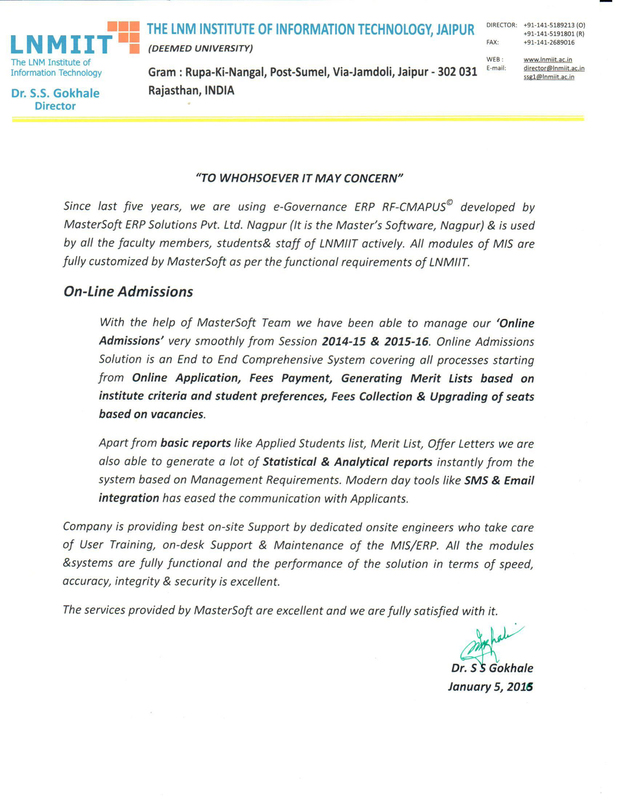 MasterSoft is providing continues on-site support with good services. 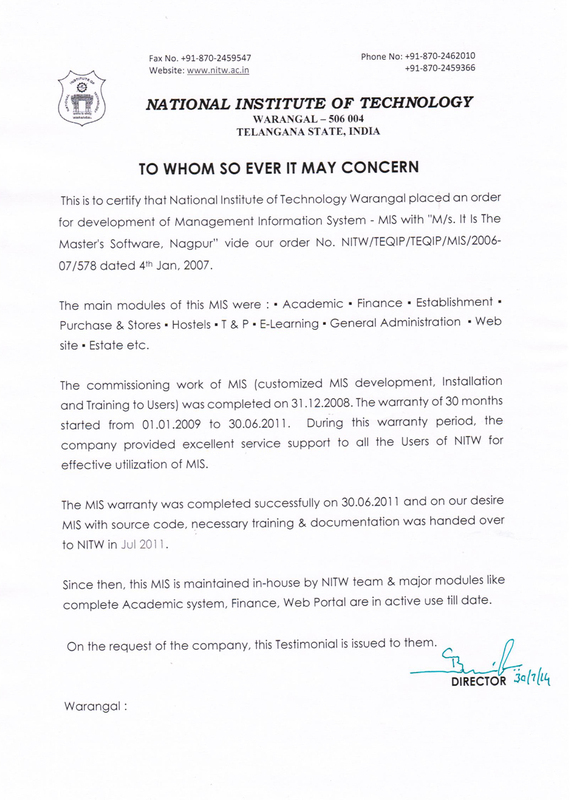 The company provided excellent service support to all the users of NITW for effective utilization of MIS. 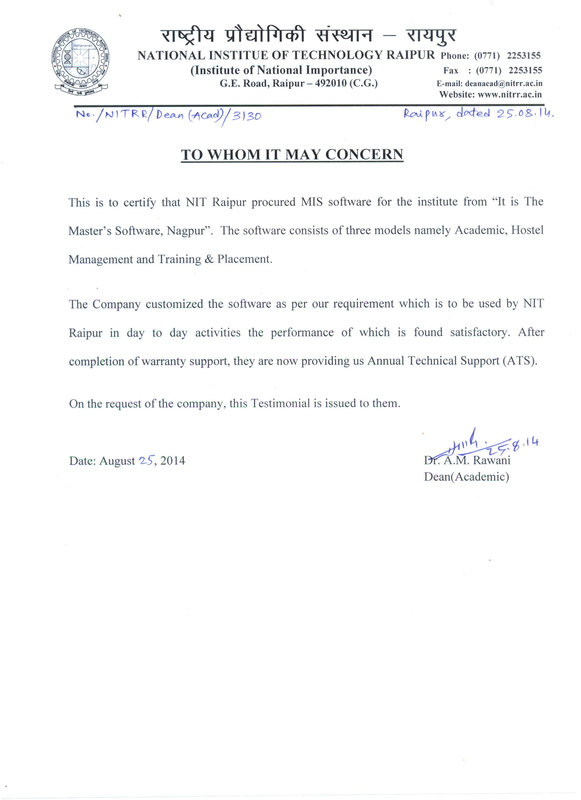 The MIS after the warranty period was successfully implemented and our desire MIS with source code, necessary training & documentation was handed over to NITW. 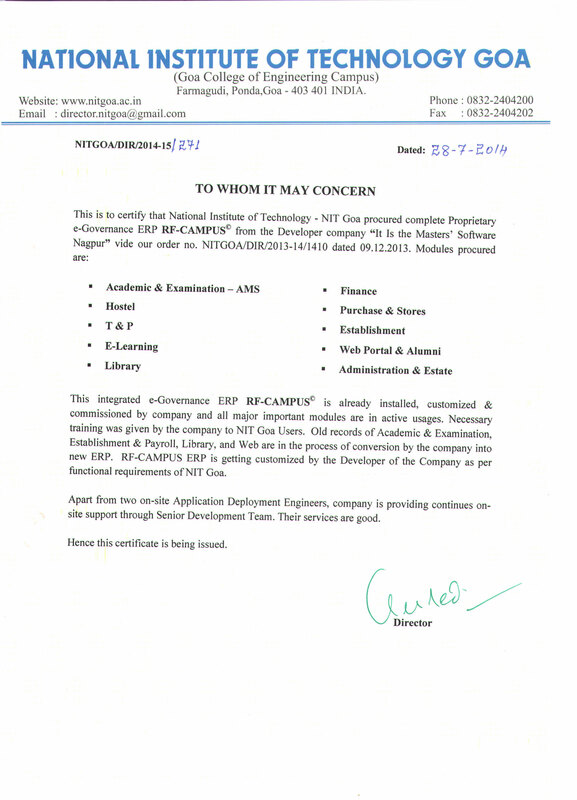 The company has customized integrated ERP RF-CAMPUS to match the functional requirements of NIT JSR. 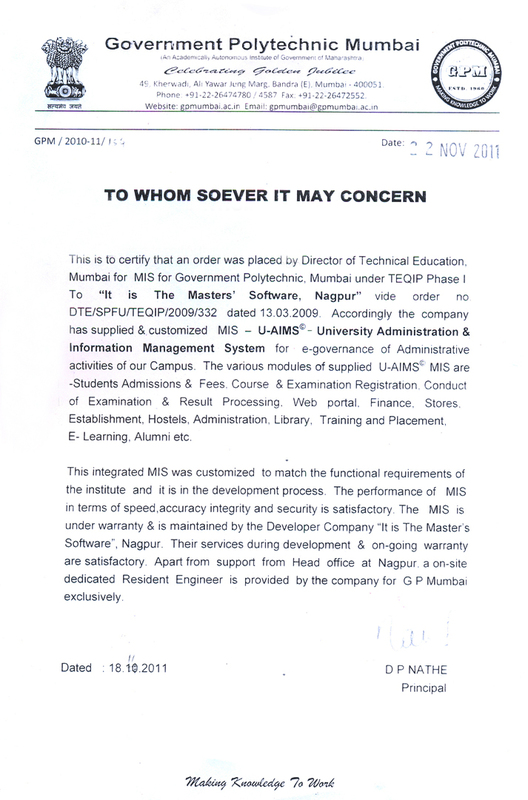 The performance of MIS in terms of speed accuracy, integrity & security is excellent. I know the company from several years. 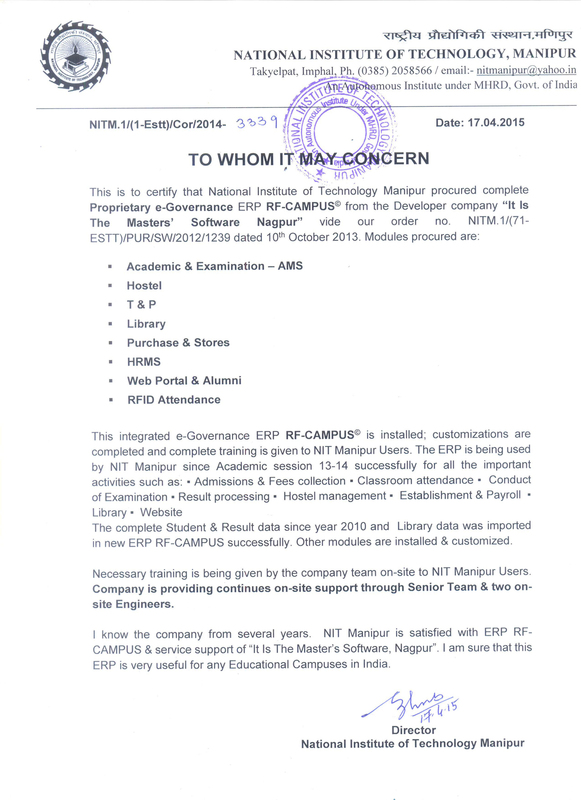 NIT manipur is satisfied with ERP RF-CAMPUS & service support of "It is the Master's Software, Nagpur". 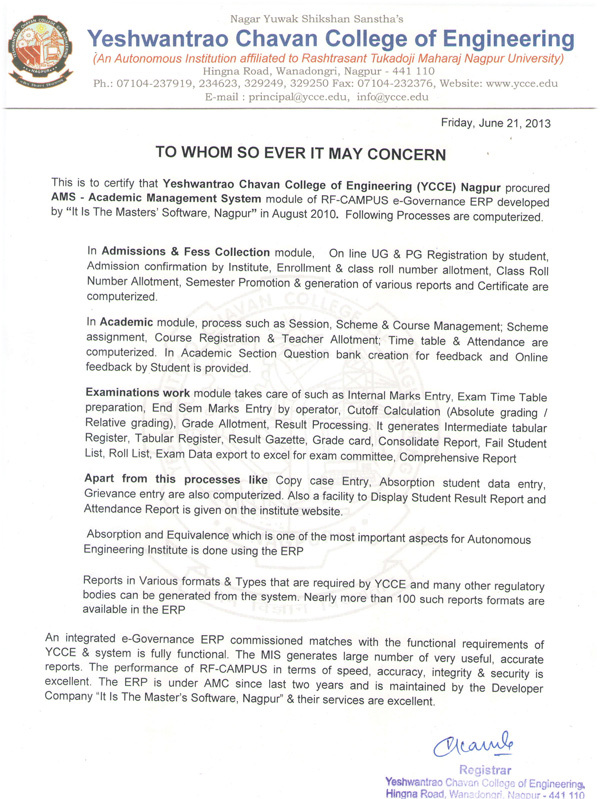 I am sure that this ERP is very useful for any Educational Campuses in India. 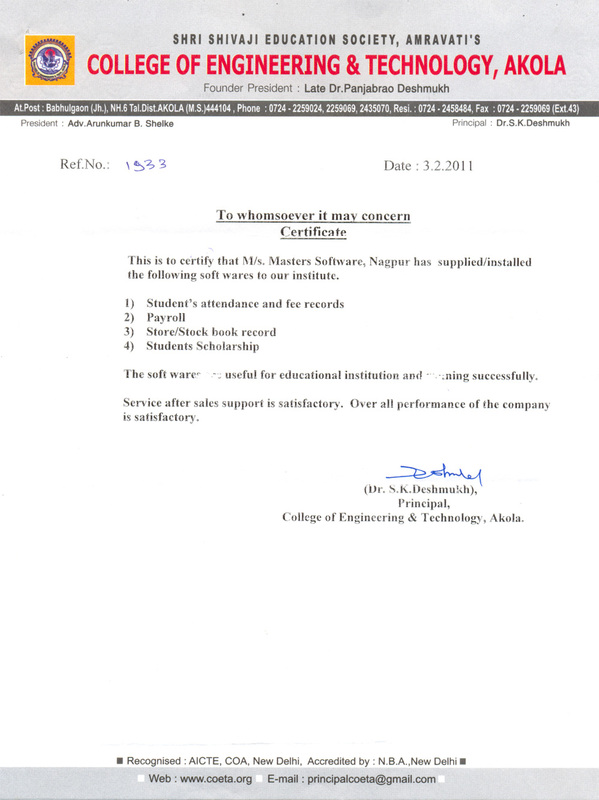 The company customized the software as per our requirement which is to be used by NIT Raipur in day to day activities. The performace is found satisfactory and also company provides technical support whenever required. Company is providing best on-site support by dedicated on-site engineers who take care of user training, on-desk support & maintenance of the MIS/ERP. All the modules & systems are fully functional and the performance of the solution in terms of speed accuracy, integrity & security is excellent. 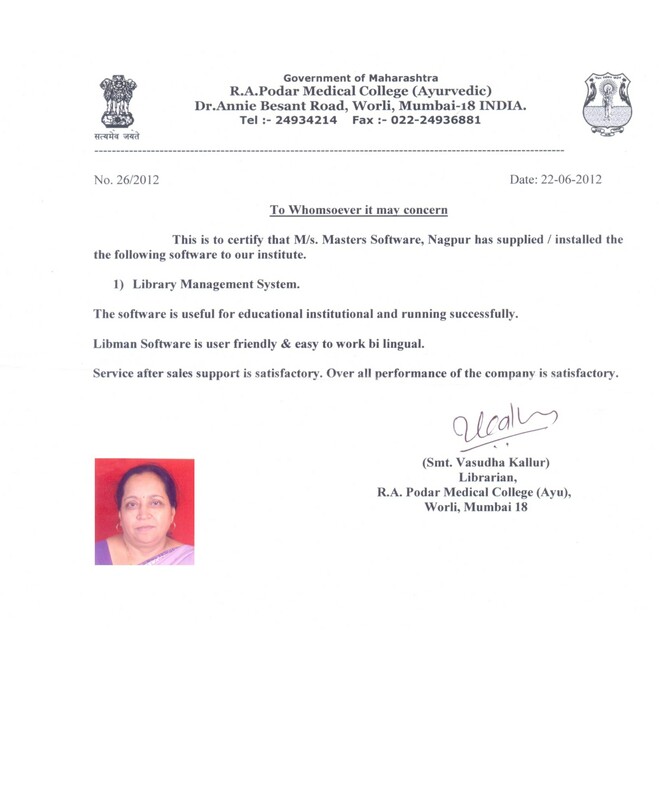 The on-site service support by the It Is The Master's Software, Nagpur, during the development, warrenty & AMC was excellent. 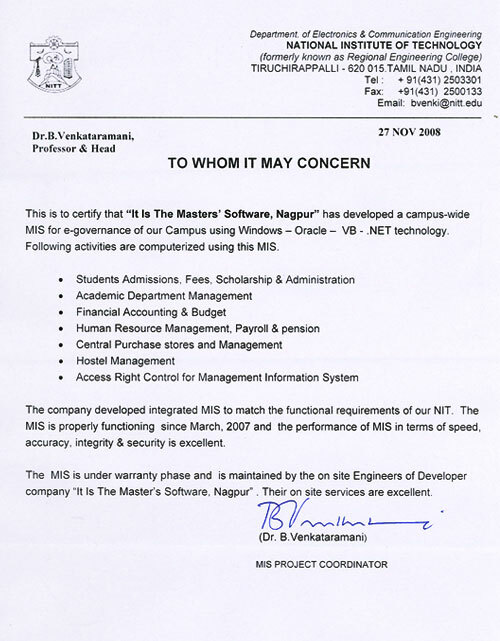 The NITC had useful & healthy association with 'It Is The Master's Software', Nagpur. 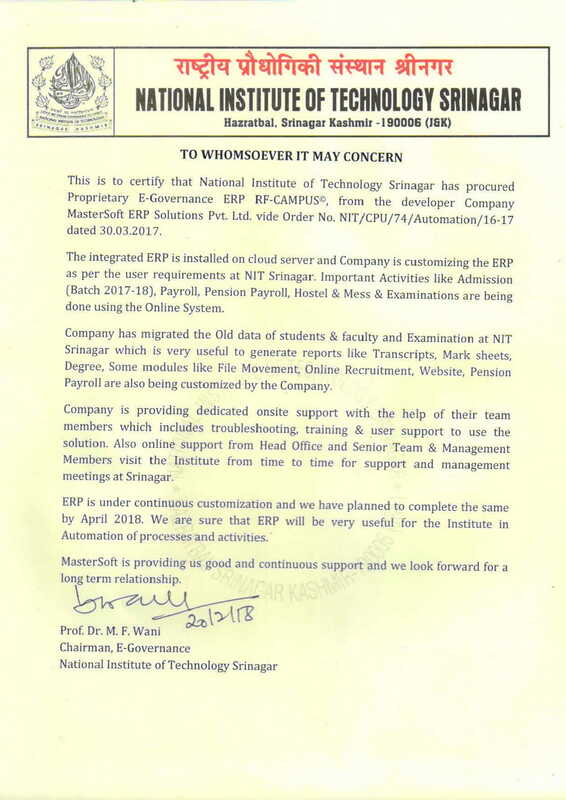 The company customized/developed ERP for e-governance of out NIT campus in modules such as admissions, academic, examinations & results, payroll and library etc. 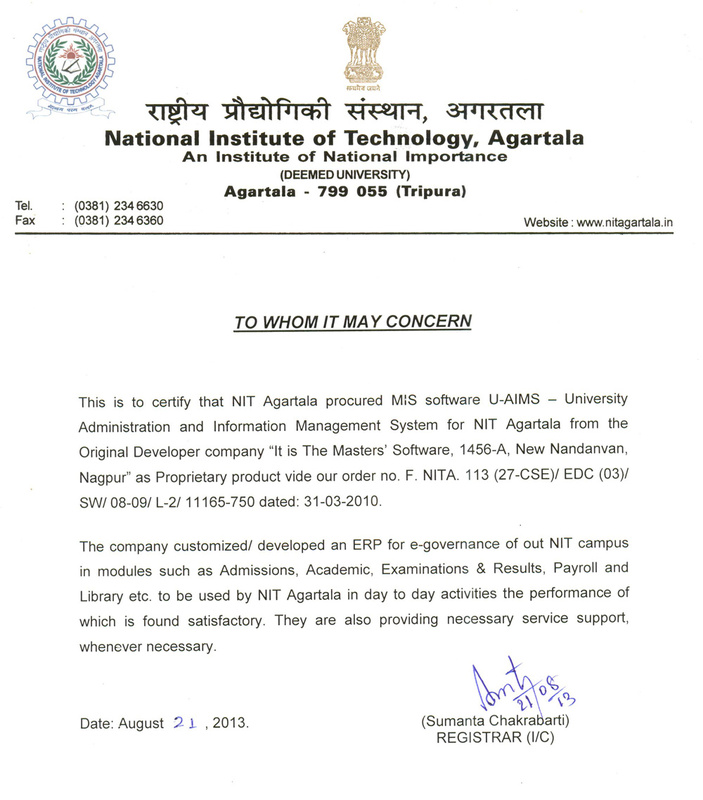 to be used by NIT Agartala in day to day activities the performance of which is found satisfactory. They are also providing necessary service support, whenever necessary. The performance of MIS in terms of speed accuracy, integrity & security is excellent. 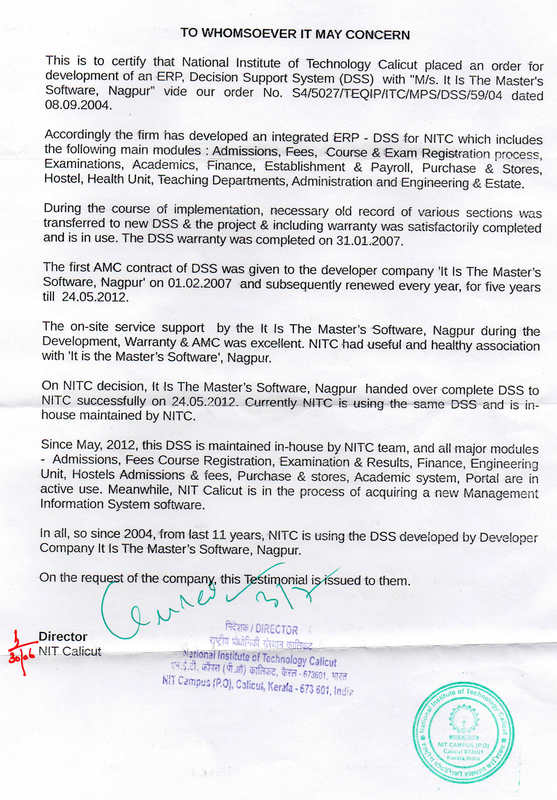 The complete MIS is maintained by developer company It Is The Master's Software, Nagpur and their services during the development, warranty & AMC phase are excellent. They have deployed two on site engineers for user service support. An integrated E-Governance ERP comissioned matches with the functional requirements of YCCE & system is fully functional. 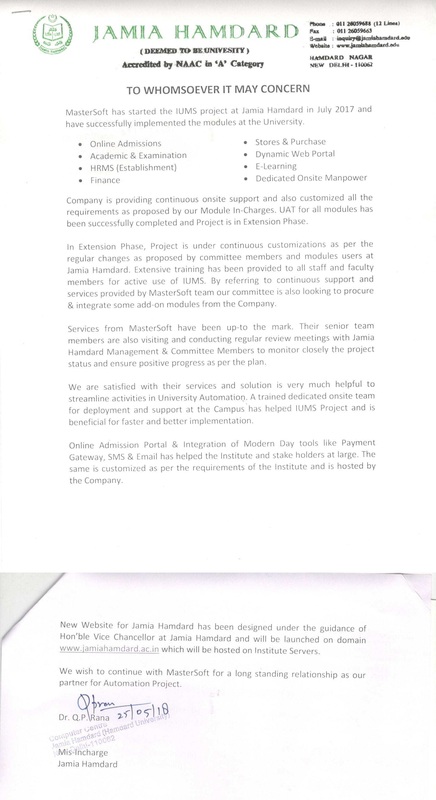 The ERP is under AMC since last two years & is maintained by the developer company 'It Is The Master's Software, Nagpur' and their services are excellent. 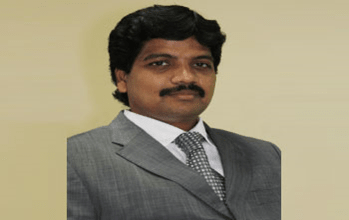 The company developed integrated MIS to match the functional requirements of our NIT. The MIS is properly functioning since March,2007 and performance of MIS in terms of speed accuracy, integrity & security is excellent. 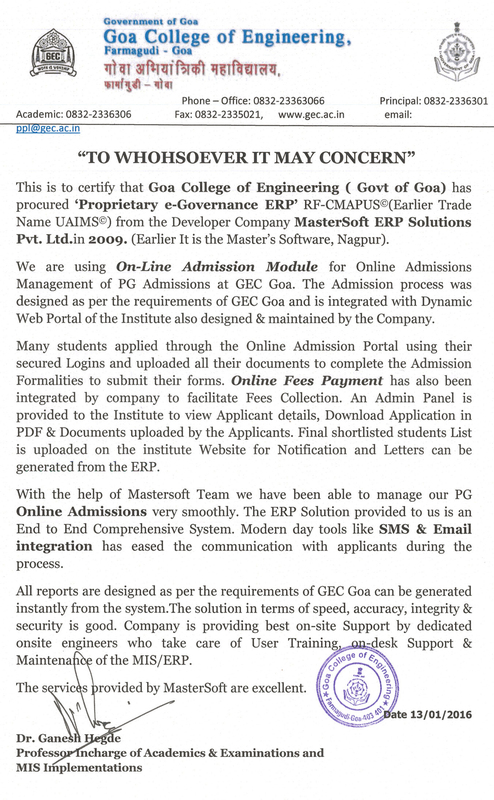 All the reports are designed as per the requirements of GEC Goa can be generated instanlty from the system. The solution in terms of speed accuracy, integrity & security is excellent. The integrated MIS was customized to match the functional requirement fo the institute. 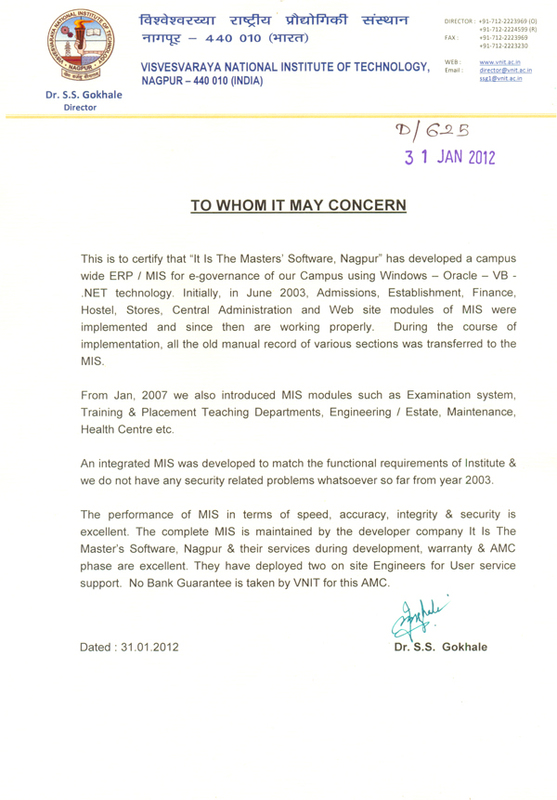 The MIS is under AMC & is maintained by the developer company It is the Master's Software, Nagpur. Their services during development & on-going AMC are satisfactory. The integrated MIS was customized to match the functional requirements fo the institute. The performance of MIS in terms of speed accuracy, integrity & security is excellent. Apart from support from head office at Nagpur, an on-site dedicated Resident Engineer is provided by the company for G P Mumbai exclusively. 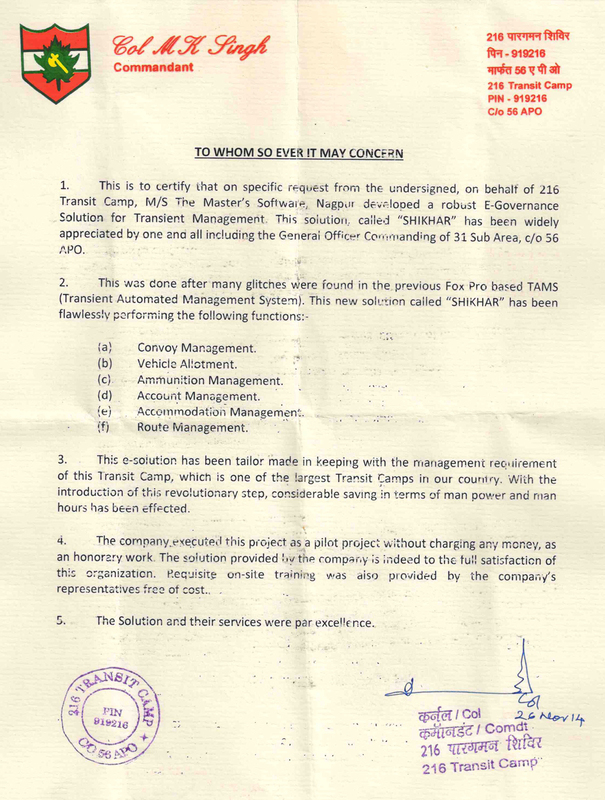 The company executed this project as a pilot project without charging any money, as an honorary work. The solution provided by the company is indeed to the full satisfaction of this organization. Services from MasterSoft have been up-to the mark. 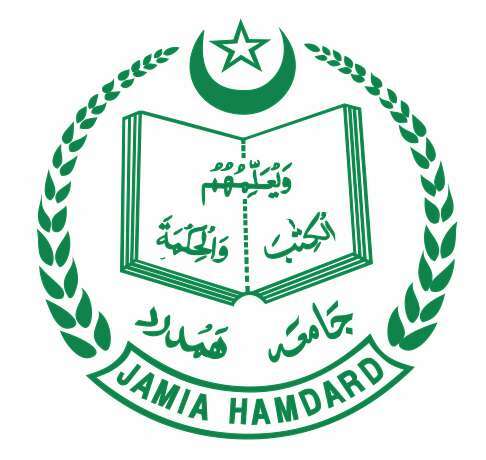 Their senior team members are also visiting and conducting regular review meetings with Jamia Hamdard management & committee members to monitor closely the project status and ensure positive progress as per the plan. MasterSoft is providing dedicated online support with the help of their team members which includes troubleshooting, training & user support to use the solution, also online support from head office. Senior team & management members visit the institute time to time for support and management meetings at Srinagar. 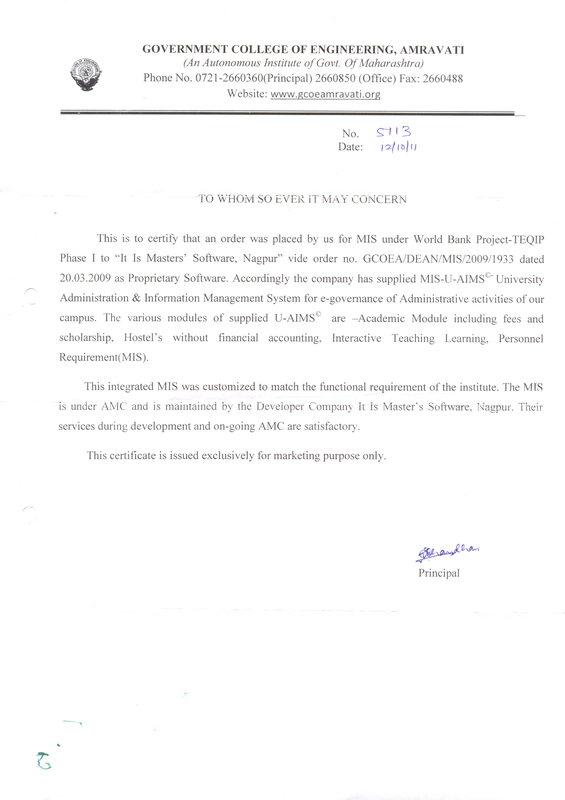 The softwares are useful for educational institution and runnig successfuly. Service after sales support is satisfactory. The service support extended by this firm is excellent throughout last eight years and with great pleasure and confidence. I strongly recommend this company and its products. 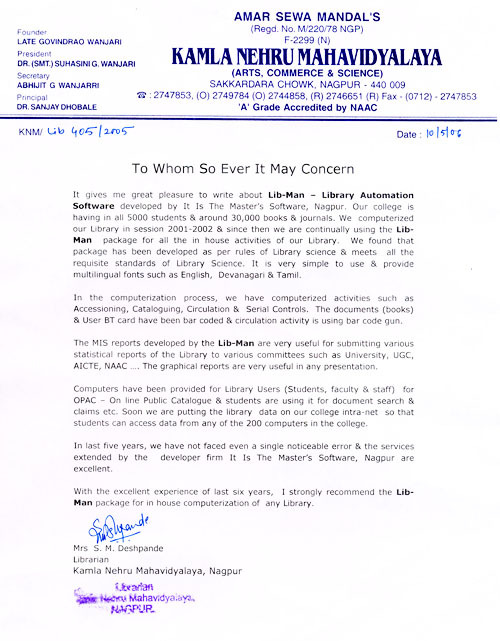 The softwares are useful for educational institution and runnig successfuly. Service after sales support is satisfactory. Overall the performance of the company is good and hence we recommend. The software is time tested & simple to use. Our staff is well trained by the company engineers on this software. Our staff is using this software without any problems from year 2002. The packages provided by the firm are excellent, very useful & services provided by the firm are very good. 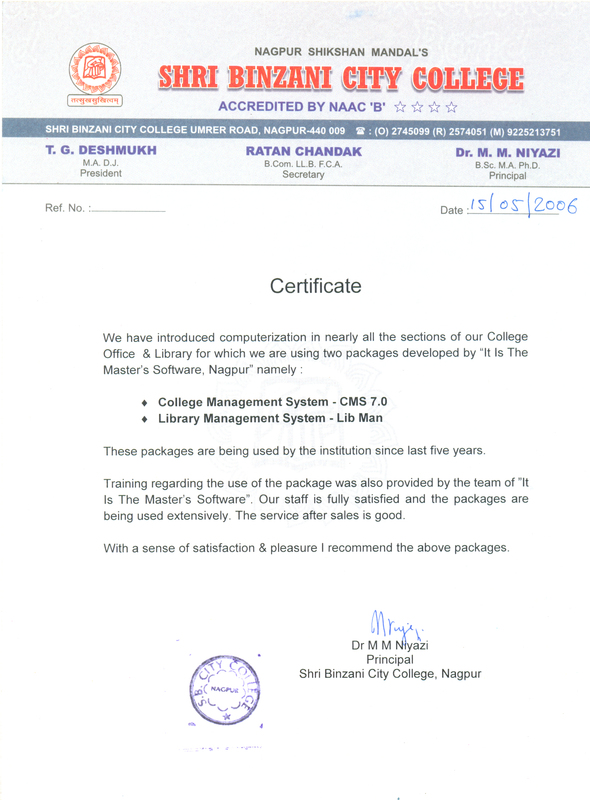 Trianing regarding the use of packages was also provided by the team of "It Is The Master's Software". Our staff is fully satisfied and the packages are being used extensively. The service after sales is good. In last five years, we have not faced even single noticeable error & services extended by the developer firm. 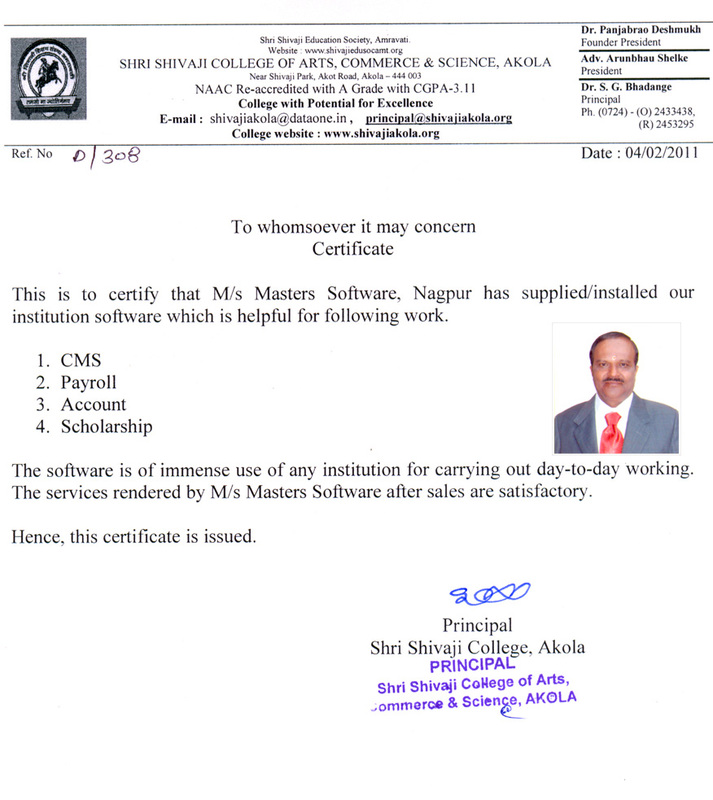 It Is The Master's Software, Nagpur is excellent. Our heartfelt appreciation, and gratitude towards Shri. 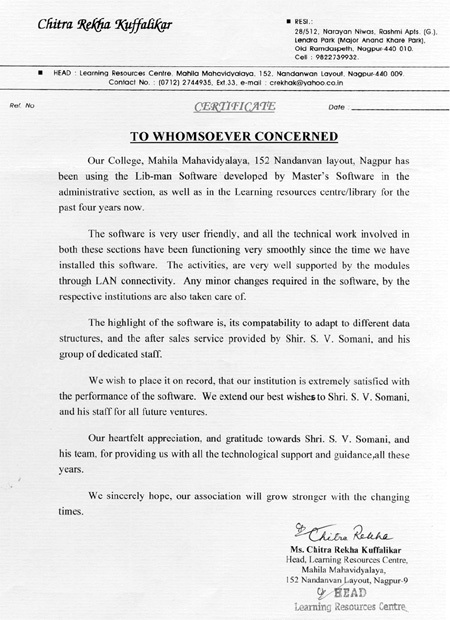 S. V. Somani and his team for providing us with all the technological support and guidance, all these years. 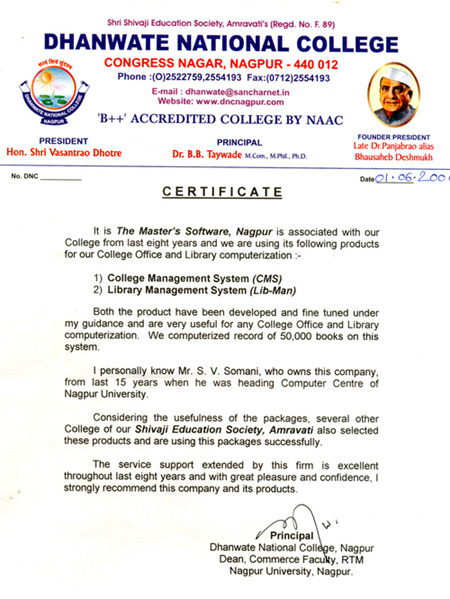 The software is useful for educational institution and running successfully. Libman software is user friendly. Service after sales support is satisfactory. Overall performance of the company is satisfactory. 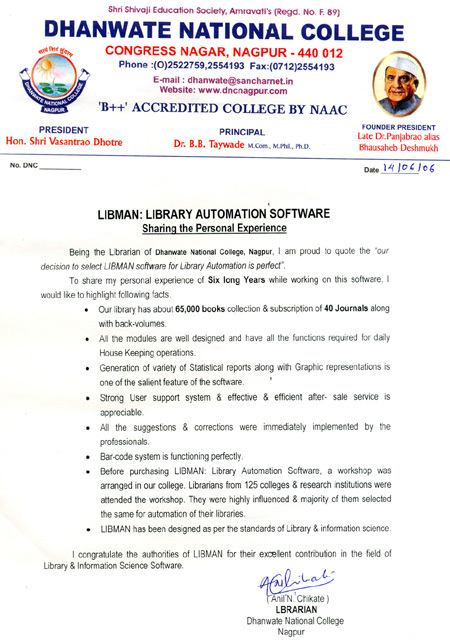 I congradulate the authorities of LIBMAN for their excellent contribution in the field of Library & Information Science Software. 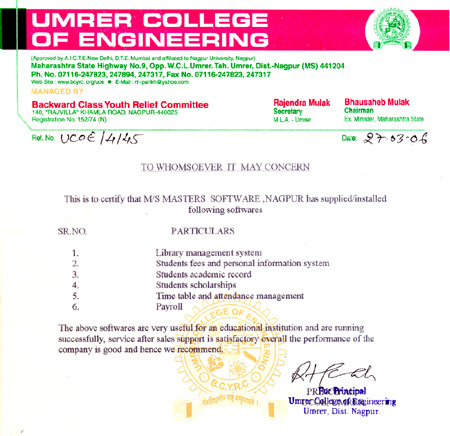 The software is useful for educational institution. and running successfully. Libman software is user friendly. Service after sales support is satisfactory. Overall performance of the company is satisfactory. The software is of immense use of any institution for carriyng out day-today working. 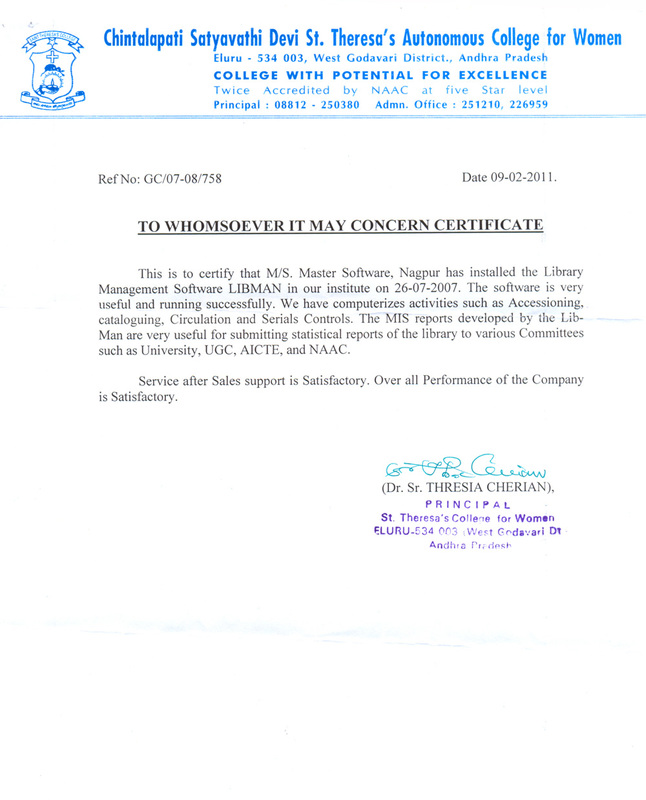 The services rendered by M/s Master's Software after sales are satisfactory. 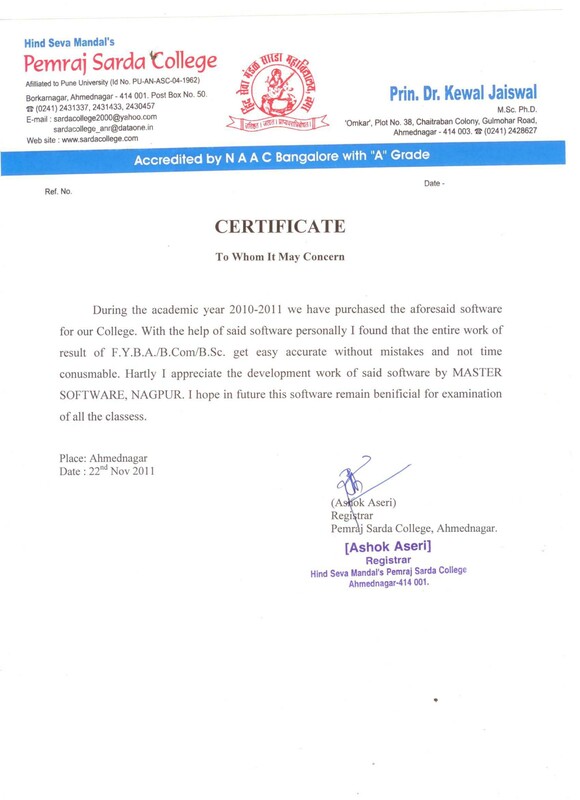 The softwares are useful for educational institution and running successfully. Overall performance of the company is good & satisfactory. 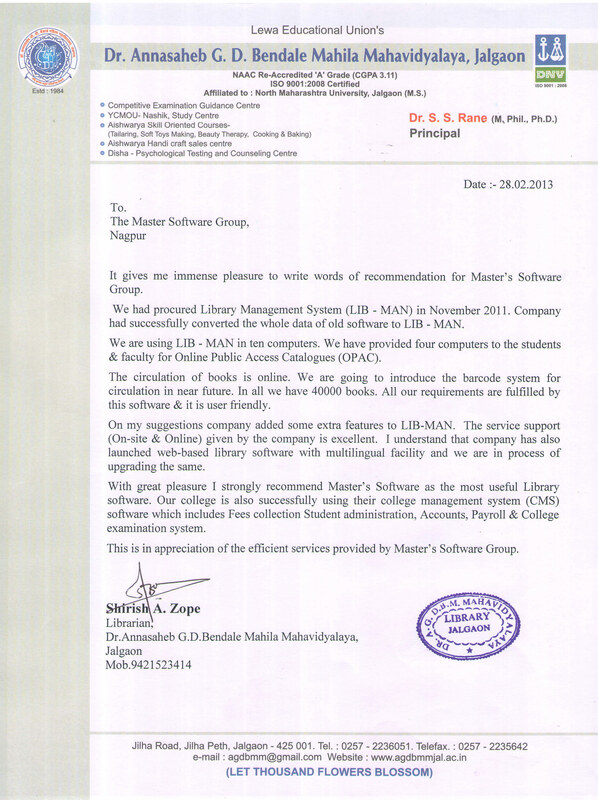 With the great pleasure I stronlgy recommend Master's Software as the most useful library software. 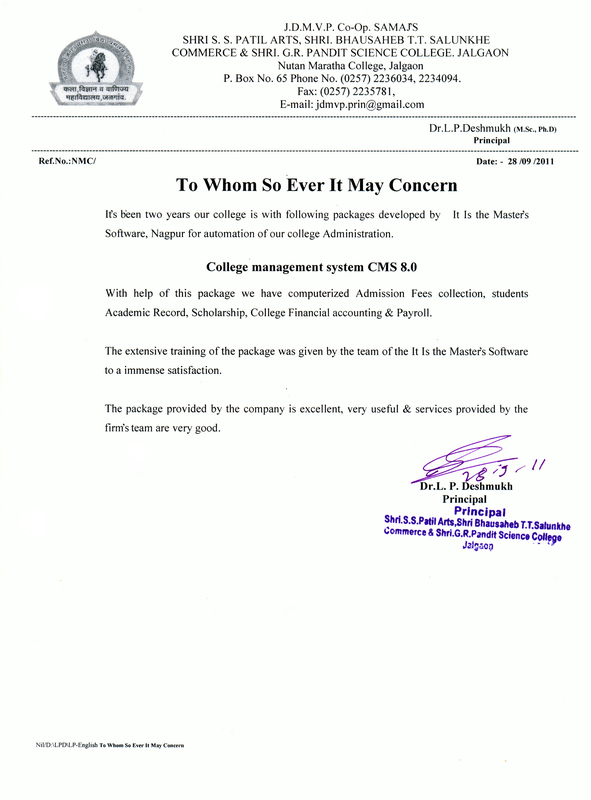 Our college is also successfully using their College Management System (CMS) software which include fees collection, student administration, accounts, payroll & college examination system. Service after sales support is satisfactory. Overall performance of the company is satisfactory. 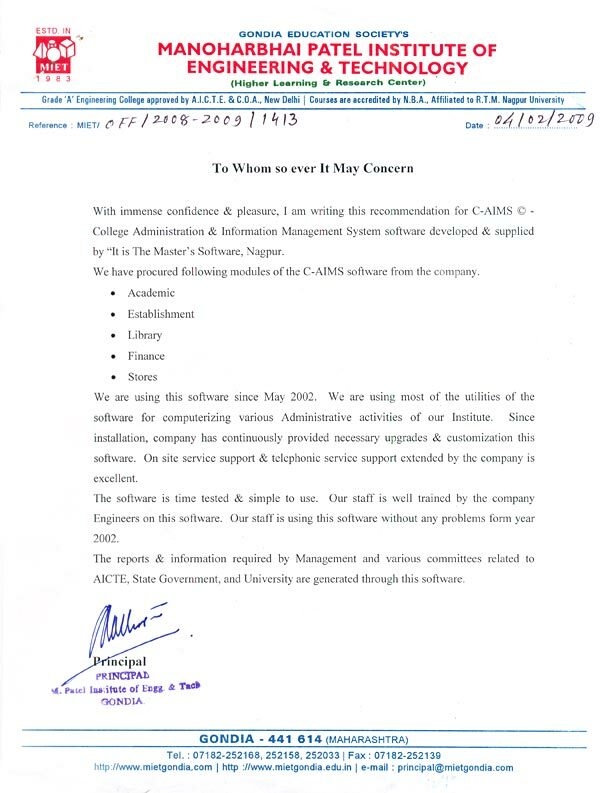 The softwares are useful for educational institution and running successfully. Overall performance of the company is satisfactory. The package provided by company is excellent, very useful & services provided by the firm's team are very good. With the help of software provided by company, I found that the entire work of result of F.Y.B.A./B.Com./B.Sc. get easy accurate without mistakes and not time consumable. I hope in future, this software remain beneficial for examination of all the classes. With the help of provided package, we have computerized admission fees collection, student academic record, scholership, college financial accounting & payroll. The package provided by company is excellent, very useful & services provided by the firm's team are very good.